Founded in 1913, and one of the nation’s oldest NCAA conferences, the SIAC is a Division II league composed of 14 member institutions spread across a six-state footprint (Georgia, Alabama, South Carolina, Tennessee, Kentucky and Ohio). But when the SIAC Council of Presidents hired attorney Gregory Moore as its commissioner in 2009, the league was grappling with significant financial challenges that included three consecutive years of budget deficits that left the league almost a half a million dollars in debt and with no cash reserves. With that as a foundation and inspired by its motto “We Play Hard,” the conference has been a laboratory of ideas and continues to push the college athletics agenda. The schools of the SIAC are Albany State University, Benedict College, Central State University, Claflin University, Clark Atlanta University, Fort Valley State University, Kentucky State University, Lane College, LeMoyne-Owen College, Miles College, Morehouse College, Paine College, Spring Hill College, Tuskegee University. “The SIAC had a vision for something that had not been done in college athletics,” said Jeff Rubin, the founder and CEO of Sidearm Sports. With a starting point of just two SIAC schools with dedicated athletic websites, the SIAC made the strategic decision to essentially construct from scratch a digital and social media infrastructure around the almost 400,000 fans who attend SIAC football games every fall. This decision ultimately resulted in all 14 SIAC member institutions sharing the same digital platform provided by Sidearm Sports. Sidearm is the developer of software that operates, according to Rubin, websites for well over 900 schools (including 35 of the BCS schools). The firm helped the SIAC become the first NCAA conference to have all member schools’ websites integrated under one conference umbrella. “The combined integrated sites sharing software allows for fresh updated content of stories, stats, video without requiring a lot of man-hours to update,” Rubin said. The idea has worked so well that Sidearm has adopted the concept for integrated platforms for other conferences. “We definitely used the experience from working with the SIAC in implementing similar digital platforms for the Pac-12,” Rubin said, expounding on their work with the Power 5 conference that introduced its integrated digital platform at the beginning of the 2016-17 academic year. The SIAC has also bulked up its social media presence. The conference reports that it has gone from last in YouTube video views to first among the Division II ranks. It also has more Twitter followers than the larger Division I HBCU conferences, as well as other major conferences such as the Big East. Finally, its mobile app – the third Division II conference to have one – is the next revenue-driving medium that will, through the development of more data analytics, enhance ticketing and merchandising by predicting fan behavior and presenting the goods and services to meet those expectations. The big bet the SIAC made in technology and social media has also had a big impact on the league’s bottom line. According to the conference, besides increasing sponsorship revenue more than 400 percent, it has more than doubled top line revenues since 2009 while also eliminating all debt from its balance sheet and building one of the largest cash reserves in NCAA Division II. “With our culture of innovation here at the SIAC, we have not only emphasized the importance of embracing digital and social media, but through conference-wide partnerships, our institutions have the tools to generate new revenue streams and experiment with different initiatives,” said Tuskegee University athletic director Curtis Campbell, the chair of SIAC Athletic Director Committee and member of the NCAA Division II Management Council. The SIAC’s diversity and inclusion initiatives are other areas where the league has been in the vanguard. Two years ago, the SIAC became one of the first NCAA conferences to partner with a professional sports league when it entered into a diversity and inclusion partnership with the NFL. The agreement with the NFL seeks to create pipelines from the SIAC pool of football officials to increase access and opportunities for candidates who aspire to reach the highest level of the officiating profession. 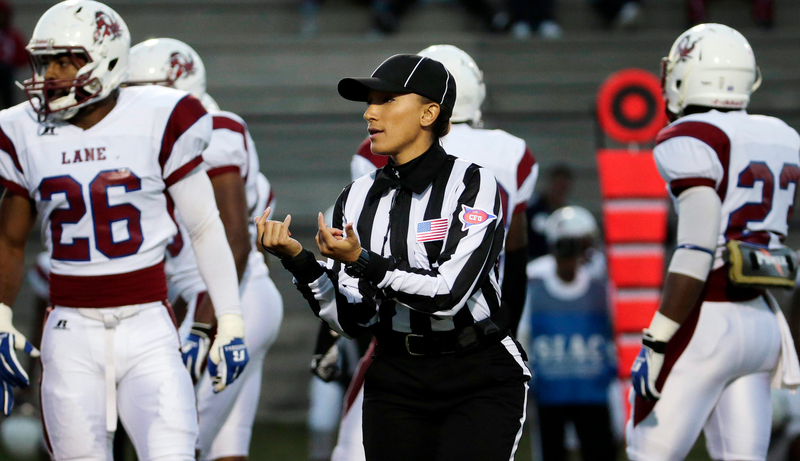 On the gender inclusion front, in 2013, the SIAC generated national headlines when it became the first NCAA conference to have an officiating crew composed of a majority of women to work a college football game. Referee Krystle Apellariz calls for the ball during an NCAA college football game between Lane College and Miles College in Fairfield, Ala., Thursday, Oct. 24, 2013. A key byproduct of the SIAC’s digital initiatives has been the positive impact on sponsorship development. These assets have strengthened existing corporate partnerships with Nike and the Coca-Cola Co., while also creating unique new sponsorship opportunities with partners such as Home Depot, the Toyota Motor Corp., ASPiRE TV Network, which is owned by Magic Johnson Enterprises, as well as Silicon Valley startup Walker & Company. Last September, the SIAC announced a partnership with Walker & Company and its flagship brand Bevel, the shaving and grooming line of services and products engineered for people of color. The black-owned company, led by former tech entrepreneur Tristan Walker, who reportedly turned down a $1.5 billion buyout offer by Gillette, was eager to work with the SIAC. Thus far, the partnership has produced a series entitled “A Bevel Homecoming Storytelling” with the brand visiting Tuskegee University to interact with the Tuskegee’s Marching Crimson Pipers as the band prepared for the school’s seminal homecoming weekend. The sleekly produced videos subtly hinted at the value of the brand’s specially designed shaving instruments and grooming products, but more significantly highlighted the function and aesthetic of the HBCU band and ultimately the HBCU mission. Martin Sumners is a freelance writer and contributor to The Shadow League, other media outlets as well as a former writer and editor for NBA.com.